Wow….the top is beautiful!! You have the right idea for finish. The chairs are a bit rustic for me…but love the nailhead look on chair and table. I am so excited for you and family. And thanks for including us on your journey. Your table is going to be similar to ours! My father planted a seed in our backyard in and it grew into a humongous gum tree over a period of 30 years! My father passed a way from cancer and when my mum went to sell our family home our new neighbors who were building a new house were worried that this huge gum tree would one day fall on their new house (It was solid as a rock but anyway….) We agreed that if they payed to get it cut down, then they could since mum was moving anyway, but only as long as we got to keep every little bit of the wood from it. We ended up with a mountain of fire wood from the smaller branches but we got a portable miller to cut the large logs into slabs for us much like the one in your picture. Us four children, now each have some slabs of our dads tree and I am now waiting until we can move into a house big enough to put our table in which my husband and I will make ourselves It is even more special now as my mum also passed away a year ago from early dimension. As for the chairs I was originally going to collect different carved antique chairs, but I have since come across a company called Haunt Furniture that make gorgeous carved chairs and I am thinking of getting their chairs from their ‘The Feast’ set, so I thought I would share, just in case they are to your tastes, although they are fancier than your rustic charm ones which I like too! I hope to have my own castle to put my table in one day too, so I am an avid reader and thoroughly enjoying every word you write so keep up the awesome work and I look forward to reading more! 😀 Thank-you! Beautiful table top and awesome castle! I’m excited to see it coming along. I just built an eighteen foot long medieval style table. Have you thought of using benches instead of individual chairs? I originally was looking at chairs but decided benches would be much cheaper and look great too. My total table and benches (enough to comfortably seat 24 adults) was less than $400 in materials and came out looking amazing. I have thought about benches, but I don’t think they would be as accessible for anyone with limited mobility, or as user friendly/comfortable being backless. $400… you must have cut the wood from your own land or something. 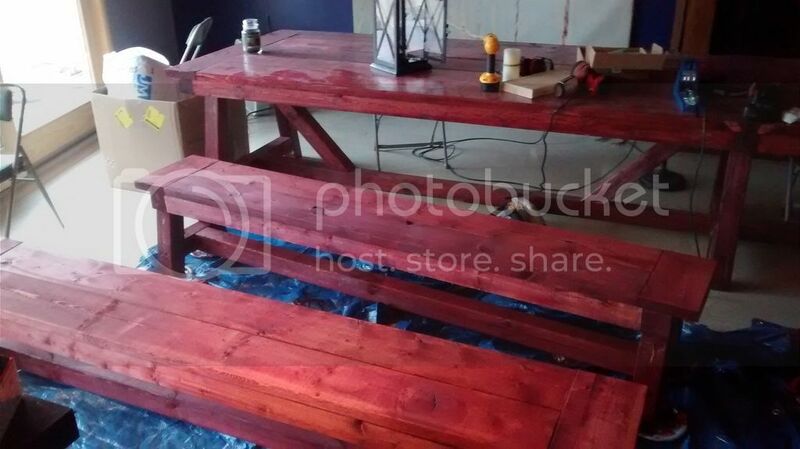 I actually used construction grade pine from a local lumber mill and stained it a nice deep Cabernet red. It’s knotty and has a lot of character but super cheap in my area of Michigan and perfect for my project. I made 4 benches and my thoughts were that if somebody needed special accommodations I could move one bench and bring in backed chairs (or just leave it open for a wheelchair). That is absolutely gorgeous! I’ve been following your blog for a while now and am interested in a similar project (building a castle, though now I may borrow your table idea as well 😉 )—would you be willing to share who you used for your architect? Feel free to email me. Thanks! Riverstreet Architecture in Chattanooga. Mostly because when some random person from Michigan called them to ask about building a castle, they returned my call. You’d be surprised at how many people think you’re a crazy person.